The Fannie Lou Hamer Institute @ COFO will recognize six agents of change during the 2014 Fannie Lou Hamer Humanitarian Awards Luncheon to be held Friday, April 4. The honorees, pictured above, will receive the Fannie Lou Hamer Humanitarian Award in an 11:30 a.m. ceremony held in Ballrooms A & B of the New Student Union on the campus of Jackson State University. 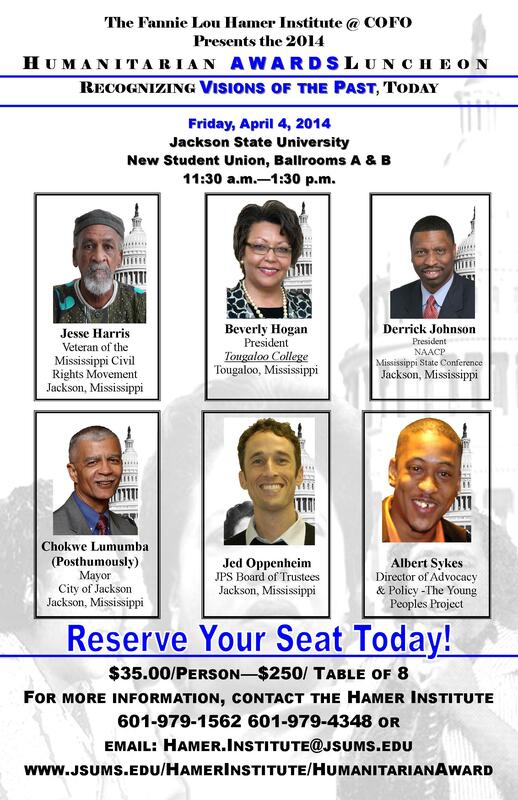 For more information about the awards luncheon, contact the Hamer Institute at 601.979.1562 or 601.979.4348, e-mail Hamer.Institute@jsums.edu, or visit http://www.jsums.edu/HamerInstitute/HumanitarianAward.